Ren is a shaman from China who came to Japan to fight Yoh Asakura and to take part in the Shaman Fight in Tokyo. In the American dub this is never mentioned. Ren starts off as a 13-year-old in the manga and the original Japanese anime, while in the English anime he first appears as a 15-year-old. He is serious, logical, and emotionally aloof. He has become like this because of how he was raised. Because of his father, Ren had adapted a deep hatred towards humanity and a strong yearning to eliminate them all. He also believed that his spirit companion, Bason, was only meant to be used as a tool and to treat him as a friend would only result in the spirit taking advantage over him. Ren's anger and hatred came from his father (or uncle in the English anime), Tao Yúan (Tao En). Forced to train and study at a very young age, Ren had his childhood stolen from him. He hated Tao En for all of his suffering. As he gains the friendship of Yoh and the others, he realizes that everything he once believed about the world was not true. He learned to trust others and that humans weren't as awful as he thought they were because Yoh and the others showed him that some people truly are kind. A new will to change himself took over. He wanted to let go of his hatred so he could be able to move on with his life, so he returned to China to defeat his father. His first attempt failed, but he refused to give in to his father, even as he remained chained in the dungeon of his home. Thanks to Bason, Yoh and the others came to help him. He thanked them for rescuing him but was persistent in saying that he didn't want any help from them. He said it was his problem alone. But eventually all of them defeated Tao Yúan together; allowing Ren to finally move on. Ren tries hard to maintain a tough and confident exterior and is aloof, but deep down would risk his life for his allies. Ren is a particularly impatient person with a very short temper, and isn't afraid to hurt the source of the anger. Ren is an egotistical person and usually doesn't care that people think that he's overly proud. He even named his own team, "Team the Ren," much to the annoyance of his teammate, Horohoro. His overflowing self-confidence annoys some of the other characters. In addition, Ren is also very intuitive, quick-witted, and sometimes stubborn. He is also very defiant. He rarely listens to what anyone says or takes their instructions. Before and during the process in which he befriended Yoh, he even was bold enough to disobey his father on various occasions. It is mentioned that Ren is skilled in more than one area of combat. 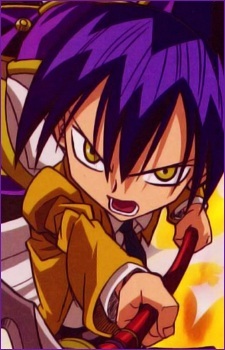 Not only is he a powerful shaman capable of doing things most shamans his age would not be able to, but in addition, he also seems to be skilled in martial arts and sword fighting, in addition to also learning many of Mikihisa Asakura's techniques simply by experiencing them firsthand. It is also lightly suggested in the manga that Ren can also play the erhu. As the series progresses, Ren begins to trust others more. Out of all his friends, his bonds with Yoh and Horohoro seem to be the strongest. Ren often fights with Horohoro and the two do not seem to get along at all. However, after Ren sacrifices himself to save him, it becomes apparent that they really do care for one another. As Faust worked to try to save Ren's life after the incident, Horohoro did his best to protect the unconscious Ren. Ren's name in Chinese means "benevolent," "tough," and "edge of a knife," all of which are reflected in his character. His actual Chinese name, Lián, means "lotus". In the English dub, he is given a British accent. He also has an obsession with milk and the number 3. In Shaman King Character Book, there was an interview asking what kind of girl he likes and he said he would only like a girl if she's smaller than him and not annoying. This must be the reason why he married Iron Maiden Jeanne and had a son named Men Tao.